For the first time on the first day of the Ramzan, the world’s largest movable dinosaur show opened at Al Fitr holiday in Dubai. It is organized by Dubai Events and Promotions Establishment’s as part of ‘Eid in Dubai’ celebrations,. The Dinosaurs Show will be held at Festival Centre, Dubai Festival City until December 2 which is UAE's National Day. 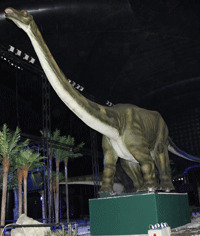 A statement said, it has full- sized moving dinosaur models, and taking place in the world’s largest helium balloon tents, the show will bring dinosaurs back to life. Dinosaur guides will be provided to the visitors on the show which teaches people about ancient times and also it has some of the most amazing species to ever walk the planet. Tickets are priced at Dh50 ($13.60) per person. Entrance tickets also include free entry into the Dino Live raffle draw to win a Dino Live car.